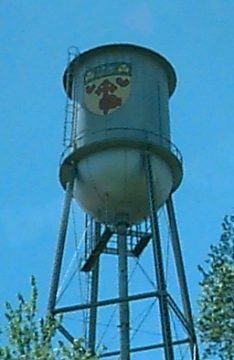 The water tower has the Macdonald Campus Coat of Arms painted on it. The colour of the field (gold) and the arm holding a cross (red) are from the second quarter of the arms of Sir William Macdonald, the tobacco manufacturer and philanthropist, who founded the College. His armorial bearings derived from the fact that he was a grandson of John, eighth Macdonald of Glenaladale. The two red martlets and the open book with its motto are from the arms of McGill University. The clover leaves (also gold) signify fertility and their three segments suggest the three purposes of the Campus, i.e. agriculture, service and food.